I knew I had to have this book as soon as I read the synopsis months ago when I featured it for Waiting on Wednesday! Sweet sounds like a totally original YA horror at sea and I am a total sucker for ship horror stories (note: The Last Ship - not that great). 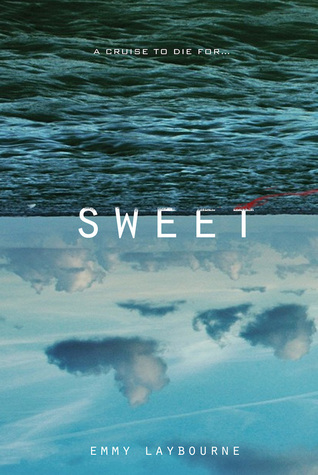 Sweet definitely delivered on originality and horror, but it really did not WOW me like I'd hoped it would. Anyway, Laurel is the main character on this weight loss cruise. She really doesn't want to be there at all, what with all the rich and famous people (I mean, really, who would want to hang out with famous people? Amirite?! ), but she was roped into it by her rich best friend, Viv. Unfortunately for all involved, Laurel is very prone to motion sickness (and I guess they don't have meds for that onboard... rich people don't get seasick), and is totally unable to eat for the first few days of their voyage. Because of this, she is unable to eat any of the mystical new sweetener, Solu (which is also what makes people lose weight). Funny enough, there's a second person on board who refuses to eat Solu, but he's not seasick. Nope, he's a big hunk of MANLY MANESS (she tells us this like, a thousand times) and works out HARD in every other chapter (often until he pukes, which he tells us often). Tom is a former child star and now he's a TV host and Ryan Seacrest's competition. He also hates his job and has never spoken to a normal person who wasn't famous (apparently). Obviously, Tom and Laurel must fall in love. Instantly. In the span of about three days (seriously, the day of the voyage is shown on every page). I didn't buy it. I didn't buy the romance at all. I swear on my honor that if I ever publish a book, there will be no instalove. This was one of the better parts of Sweet, although even the cruise ship setting was a little lacking. (Having just come off a cruise myself, I have the idea of a luxury cruise ship pretty fresh in the ol' thinking cap.) The atrium of the ship was really richly described and I thought I would be in for similar world building (ship building?) throughout the book, but no such luck. There was so much opportunity for vivid detail in Sweet! (It's a top of the line cruise ship!) But I could see the luxury at all. Like I've already said, the plot was totally original, but maybe it was too original... The pace was breakneck, which I actually did enjoy a lot because it kept me turning pages and made this a really quick read! That being said, everything in the plot was underdeveloped. The symptoms of Solu were introduced way too quickly to be believable, for one thing. BUT I did enjoy the story. A lot. This was actually going to be a three star book for me (liked it). Then I hit maybe the last 30-40 pages and I just couldn't. First of all, things just started getting ridiculous. Solu was terrifying enough before things started taking a zombie-vampire turn... my suspension of disbelief can only be taken so far. And then near the end, when the whole cause behind things gets explained, I literally started ranting out loud in an empty room. I kid you not, the words "bull crap" actually came from my mouth as I started squinty-eyed at the page. Things are explained, but they make absolutely no sense at all. None. I'm a "why" person, and I asked, "but why?" probably 20 times (out loud). And then there's Laurel (again). Remember when I said she was a maniac? She makes freaking idiot decisions. B) go back with your now-crippled boyfriend into the throng of psychos and BLOW UP THE FREAKING SHIP! Option B, obviously. Right? (nobody?) Um... DUH. Not to mention, she blew up EVERY OTHER FREAKING PERSON ON THE SHIP! Seriously? WHAT THE HELL, LAUREL?! And guess what? Solu is still being released. Because your dumb self has been unconscious in a hospital for who knows how long because you BLEW YOURSELF UP YOU IDIOT! I just seriously can't with this girl. I haven't read anything else by Emmy Laybourne. Her Monument 14 series has been on my TBR list for so long and now I'm seriously reconsidering ever picking it up. And one last thing. Her writing. Notice the fifty thousand parenthesis throughout this review? That's basically the whole book. I guess it's not a huge deal, but it was annoying. I'm not giving this one star because I didn't completely hate it and one star is reserved for books I completely hate. This did have a unique premise and it was totally creepy and fast paced and I liked it okay. Until the end. And then it was dumb. Really though, this is more like a one-and-a-half star book, I just don't do halvesies on my blog. So take from that what you will, I guess.